In June of 2007 we hunted the Jack Ranch, another property managed by Bert Claassen. The Jack Ranch is near the town of Parkfield, about 15 miles from the town of Cholame. Cholame is at the intersection of CA HWY's 46 and 41, and is famous as the location of the tragic death of James Dean. The ranch includes 85,000 acres of property. The next morning, Mike Sanders and myself hunted with guide Tony Phelps. Mid morning we quietly approached a heavily brushy canyon which was known to often hold pigs. Tony placed us in position with a good view of the opposite canyon hillside while he worked his way down into the canyon hoping to jump pigs out their bed. While he worked his way down I took the opportunity to use the range finder to establish distances to the likely shooting lanes. I read 200 yards at best, up to about 275. Shortly, very shortly in fact, Tony yelled that a pig was on it's way up the hill. I was shooting my .338 Win Mag this day, loaded with 210 grain Barnes TSX solid copper bullets, and I sight this load to be on target at 275 yards. No hold over required at this range. We spotted the pig heading up at a steep angle on the dead run. I led a good bit, holding just ahead of his nose, and touched off the shot. I connected and put the boar down hard, but my lead was not great enough and I hit him in the rear quarters and he had enough left to get up and head uphill again. Still running, but not as fast, I led him again by about the same distance and this shot hit him behind the ear and dropped him for good. Two shots, not placed as desired, but he was down. It was a tough haul getting him down one side and up the other of the brush choked canyon, even though we used the truck and about 800 feet of rope to pull. We repeatedly snapped the rope from chafing it around trees. We managed to get back in time for lunch. 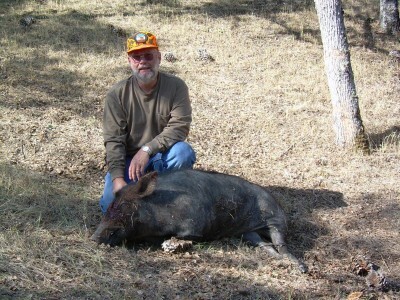 Ron Pounds connected on a pig while hunting with Marc at just about the same time as my kill, so by lunch on Saturday we had 4 out of 5 pigs down. 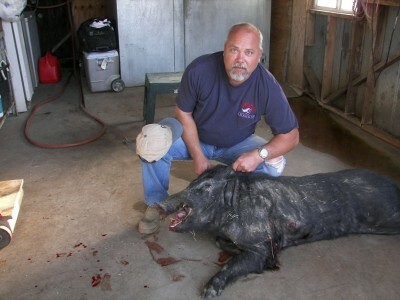 That just left Mike Sanders who hunted that evening with Tony and connected on his pig within just a couple of hours. For our party we had 5 pigs killed in a day and a half of hunting. 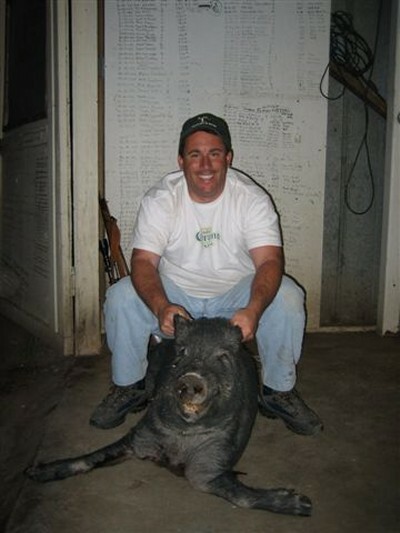 All the pigs were 200 pounds or higher. This last picture is of a bullet removed from my pig. 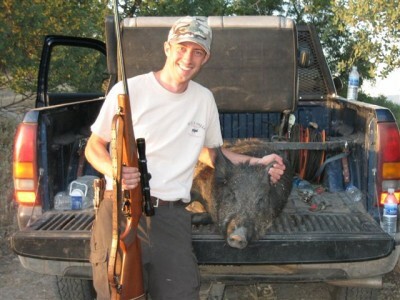 This is the round that hit the boar in the rear quarters. It is a Barnes Triple Shock X bullet, 210 grain boattail. 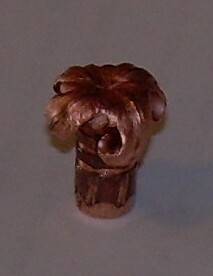 These bullets are solid copper and are known for deep penetration without loss of mass. This perfectly mushroomed bullet retains 100% of it's original weight. While I did not make a perfect shot on the animal, the Barnes bullet performed perfectly.